Atheism, denying existence of God is contrasted with theism, which in its most general form is the belief that at least one deity exists. Humanism is the new name which is more humane. With the spread of freethought, skeptical inquiry, and subsequent increase in criticism of religion, application of the term narrowed in scope. Arguments for atheism range from the philosophical to social and historical approaches. Rationales for not believing in any supernatural deity include the lack of empirical evidence, the problem of evil, the argument from inconsistent revelations, and the argument from nonbelief. Atheism is accepted within some religious and spiritual belief systems, including Jainism, Buddhism, Hinduism, Raelism, Neopagan movements such as Wicca, and nontheistic religions. Jainism and some forms of Buddhism do not advocate belief in gods, whereas Hinduism holds atheism to be valid, but some schools view the path of an atheist to be difficult to follow in matters of spirituality. While Islam is the fastest growing religion in the world, a global 2012 poll reported that 13% of the participants say they are atheists. Keeping in view the numbers of atheists it is important that they be given due considerations. Hence effort has been made to introduce the concepts of atheism with a view to provide rational and pragmatic approach to monotheism. Chapter-1: A New Religion or Ideology? Thoroughly confused paradoxically some find an easy alternative in ‘Humanism’, which comparatively appears to be rational and scientific, though focusing on materialism excluding spirituality. Interestingly ‘Humanism’ is the brain child of Unitarians and followers of Universalism, the anti Trinity Christians groups. Many resolute people like Yusuf Estates, Dr. Gary Miller, Malcolm X, Leopold Weiss with little effort find the Truth, available in the uncorrupted last scripture revealed to the last Prophet, in which God says: “Indeed, the truth deny they who say, “Behold, God is the Christ, son of Mary” – seeing that the Christ [himself] said, “O children of Israel! Worship God [alone], who is my Sustainer as well as your Sustainer.” Behold, whoever ascribes divinity to any being beside God, unto him will God deny paradise, and his goal shall be the fire: and such evildoers will have none to succour them! Indeed, the truth deny they who say, “Behold, God is the third of a trinity” – seeing that there is no deity whatever save the One God. And unless they desist from this their assertion, grievous suffering is bound to befall such of them as are bent on denying the truth. Will they not, then, turn towards God in repentance, and ask His forgiveness? For God is much-forgiving, a dispenser of grace. The Christ, son of Mary, was but an apostle: all [other] apostles had passed away before him; and his mother was one who never deviated from the truth; and they both ate food [like other mortals]. Behold how clear We make these messages unto them: and then behold how perverted are their minds! Say: “Would you worship, beside God, aught that has no power either to harm or to benefit you – when God alone is all-hearing, all-knowing?” Say: “O followers of the Gospel! Do not overstep the bounds [of truth] in your religious beliefs; and do not follow the errant views of people who have gone astray aforetime, and have led many [others] astray, and are still straying from the right path.”(Qur’an;5:72-77). “AS FOR THOSE who are bent on denying the truth and on barring [others] from the path of God – all their [good] deeds will He let go to waste;’ whereas those who have attained to faith and do righteous deeds, and have come to believe in what has been bestowed from on high on Muhammad – for it is the truth from their Sustainer – [shall attain to God’s grace:] He will efface their [past] bad deeds, and will set their hearts at rest.” (Qur’an;47:1-2). This is an endeavour to briefly introduce ‘Humanism’ with a view to ascertain its viability viz the strictly monotheistic faith: The Islam. Is Humanism a new religion or ideology? To find an answer one has to describe ‘Religion’, which may be defined as: ‘A personalized set or institutional system of beliefs and practices pertaining to the supernatural’. [Supernatural: An order of existence beyond human experience and observation]. This definition is intended to be as broad as possible, so that it includes as many of the recognized religions in the world as possible. Religion, as defined here, in no way depends on belief in the existence of God, gods, or any deities, whatsoever. This definition includes those who practice Japanese Shinto, for example, though they may not believe in any God or gods at all. It also includes shamanistic religions that, rather than focus on gods, focus instead on “behind the scenes forces”, supernatural forces. Rudolf Otto (1869-1937), the German theologian, philosopher, and historian of religion, coined the term ‘numinous’ (supernatural, mystical or spiritual) to designate the non-rational element of religious experience—the awe, fascination, and blissful exultation inspired by the perception of the divine. He believed that religion provided an understanding of the world that was distinct from and beyond that of science. He said; “The most important part of religion can not be stated through words. This is (apparently) illogical part of religion. Stable part of religion is the ideological part which is very important. But we should not forget that there is more which can not be put in to words’. The beliefs and practices may be religious even though they are non theistic. A theist is in the position of making a positive claim about the existence of God. They are willing to assert something like “God exists”. An atheist makes a negative claim about the existence of God. They would assert that “God does not exist”. Both the theist and the atheist are making claims about the existence of entities in the universe. The agnostic is in a different position. An agnostic might say: “when it comes to God, I just don’t know whether or not God exists”. An agnostic is not willing to make a commitment either way about the existence of a God in the universe. Religions attempt to answer basic questions intrinsic to the human mind like: existence of God, creation of universe and humanity, human sufferings, evil, death and its aftermath etc. The main outwardly focused Abrahamic religions e.g., Judaism (Hebrews), Christianity, and Islam attempt to satisfy human quest through the Revealed knowledge received by the prophets and messengers of God, while inwardly focused religions like Jainism, Buddhism make use of perception of the true nature of reality. While exploring the historic development in theosophical and scientific aspects about ‘The God’ and ‘The Creation’ specifically in the three religions linked to Abraham (who was neither Jew nor Christian, rather the one who had totally surrendered in obedience to the will of God). This original religion of Abraham was revived in its unique spirit of monotheism, fourteen hundred years ago in concordance with the light of reason; exclusive of mysterious doctrines to cast a shade of sentimental ignorance round the original truths rooted in the human intellect, representing the latest development of the religious faculties. 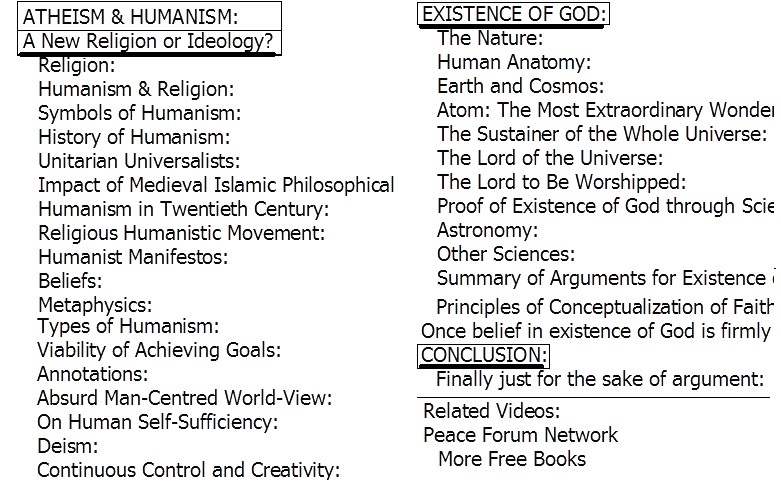 The beliefs supporting the existence of God or against it, including the middle positions have resulted in an array of doctrines, the most prominent among them are; Theism, Monotheism, Theodicy, Deism, Agnosticism and Atheism [now also emerged as Humanism]. ‘Humanism’ does not fit in to the classical definition of religion. It is an ideology or a system of thought that centers on human beings and their values, capacities, and worth. However since it presents itself as replacement of religion it could also be considered as religion. 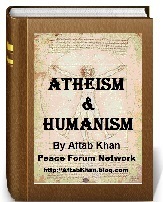 ‘Humanism’ is concerned with the interests, needs, and welfare of human beings like. The ‘Humanism’ is also the study of the humanities; learning in the liberal arts. The cultural and intellectual movement of the Renaissance that emphasized secular concerns as a result of the rediscovery and study of the literature, art, and civilization of ancient Greece and Rome is also called Humanism. Humanism, as a humanistic philosophy viewed as a nontheistic religion antagonistic to traditional religion. The definition of humanism as anthropocentricity or human-centeredness has a firmer claim to correctness. Humanism is not a religion in the sense that it has nothing to say about the supernatural other than to reject it, along with all religious claims about knowledge of the supernatural. It does have a lot to say about nature, society and the self. Lamont says of Humanism in general: “That it is a philosophy of joyous service for the greater good of all humanity in this natural world and advocating the methods of reason, science and democracy.”Humanists believe that all forms of the supernatural are myth. Nature is the totality of all being, existing independently of any mind, mentality or consciousness. Physical nature is all there is. It is composed of matter and energy and it exists in an ever changing state of flux governed by the laws of science. Though Humanism advocates the equality of sexes, its initial symbol ‘Vitruvian Man’ is taken from Leonardo Da Vinci’s drawing. Leonardo da Vinci [1452-1519] was an Italian painter, engineer, musician, and scientist. The most versatile genius of the Renaissance, as a painter Leonardo is best known for ‘The Last Supper’, ‘Vitruvian Man’ and ‘Mona Lisa’. The pen and ink drawing by Leonardo da Vinci, depicting a man fitting his body to a circle and a square by adjusting the position of his arms and legs, is probably the most famous drawing in the world on the proportions of temples, he states that these buildings should be based on the proportions of man, because the human body is the model of perfection. He justifies this by stating that the human body with arms and legs extended fits into the perfect geometric forms, the circle, and the square. The circle, being connected to the dome of the sky and the cosmos with its spherical stars and planets continually circling the earth was a symbol of Dionysus, the soul. [Dionysus: The Greek god of vegetation and fruitfulness, known especially as the god of wine and ecstasy.] The square, on the other hand, is the natural way that humans relate to the physical world. This is why there are four directions, four seasons, and four basic elements. It is why a house has four sides and people sit on a four-legged chair. The square was a symbol of the Titanic human aspect. The first step to the liberation of the soul is to recognize that we are made of both aspects. In Pythagorean thinking, if a human can be shown to fit into both symbols this would be a geometric proof of our dual nature. In Venice around the year 1500, Leonardo once again demonstrated geometrically that the human soul is divine. The official symbol adopted by the International Humanist and Ethical Union (IHEU), Great Britain, a world body for Humanism, it has also been adopted by many Humanist organisations and individuals worldwide is ‘The Happy Human’ (originally the Happy Man). Early Humanism- Ancient Greece: Greek philosopher and agnostic, Protagoros asserted: “Man is the measure of all things, of things that are, that they are, and of things that are not, that they are not.” Protagoros was a forerunner to Humanist views because he emphasizes the primacy of human values. His agnosticism is evident when he asserts: “As to the gods, I have no means of knowing either that they exist or do not exist. For many are the obstacles that impede knowledge, both the obscurity of the question and the shortness of human life.” Protagoros was banned from Athens for his “impiety” and his works were burned. Ancient Asian Humanism: Human-cantered philosophy that abandoned the supernatural can be found as early as 1000 BCE in the Lokayata system of Indian philosophy. Also in the sixth-century BCE, Gautama Buddha is reported to have expressed, in the Pali literature, a skeptical attitude toward the supernatural. Jainism rejects the idea of a supreme being, a creator, a creator spirit, even of creation. They consider universe to be eternal and uncreated. Confucianism, the scholarly tradition and way of life propagated by Confucius in the 6th–5th century BC and followed by the Chinese for more than two millennia. Though not organized as a religion, it has deeply influenced East Asian spiritual and political life in a comparable manner. The core idea is ren (“humaneness,” “benevolence”), signifying excellent character in accord with li (ritual norms), zhong (loyalty to one’s true nature), shu (reciprocity), and xiao (filial piety). Christian Roots: Rejection of mysterious and irrational doctrine of Trinity by pragmatic Christians is ongoing process. Arius [256-336 CE, Bishop of Alexandria] taught that Jesus was human with a beginning and an end. Jesus was a special human being, but human, not divine. – Arianism was condemned at first Ecumenical Council at Nicea [325 CE], though it survives in different forms even now. In 1553 CE – Michael Servetus was executed by the Calvinists for declaring the trinity to be a mad doctrine, declaring God as one indivisible. “Your Trinity is a product of subtlety and madness. The Gospel knows nothing of it… God is one and indivisible.” During 1700’s – Deism flourishes in Europe and the United States. The Universalists also originated in the 1700’s. The Universalists opposed the Christian dogma of eternal punishment for sinners. They believed that God “will finally restore the whole family of mankind to holiness and happiness. In 1825- The Unitarian Church broke away from Congregationalists. Unitarianism is the religious movement that stresses the free use of reason in religion, holds generally that God exists only in one person, and denies the divinity of Christ and the doctrine of the Trinity. They are creedless and deny the authority of dogmas promulgated by church councils. Their teachings historically have included the unity of God, the humanity of Jesus, mankind’s religious and ethical responsibility, and the possibility of attaining religious salvation through differing religious traditions. They emphasize the authority of the individual’s religious conviction, the importance of religiously motivated action for social reform, democratic method in church governance, and reason and experience as appropriate bases for formulating religious beliefs. Their traditional concern for social issues has caused Unitarian Universalists to give active support to the demands for equality of blacks, feminists, and other groups. Gains in equality for women within the Unitarian Universalists Association were significant, but its predominantly white, middle-class membership remains an issue. Islam is the faith based upon knowledge, reason and wisdom, for it is ultimately knowledge of the Oneness of God combined with faith that saves man in this world and hereafter. The Qur’an is full of verses urging man to use his intellect, to deliberate, to think and to know, for the objective of human life is to ascertain the Truth, which could be achieved by recognizing and exploring the sings of God all around. Qur’an says: “Are the knowledgeable and the ignorant equal? In fact, none will take heed except the people of understanding.”(Qur’an;39:9), “He also made subservient to you whatever is between the heavens and the earth; all from Himself. Surely there are signs in this for those who think.”(Qur’an;45:13), “O’ Lord ! Increase my knowledge” (Qura’n;20:114, “[All this have We expounded in this] blessed divine writ which We have revealed unto thee, [O Muhammad,] so that men may ponder over its messages, and that those who are endowed with insight may take them to heart”(Qur’an;38:29). It is obligatory for all the Muslims both men and women to acquire the knowledge of all sciences including the religious sciences to understand the signs of God and to harness the powers of nature. In early days of Islam, the knowledge of Din (faith) and dunya (worldly affairs) were not separate entities. The early Muslim education emphasized practical studies, such as the application of technological expertise to the development of irrigation systems, architectural innovations, textiles, iron and steel products, earthenware, and leather products; the manufacture of paper and gunpowder; the advancement of commerce; and the maintenance of a merchant marine. Thus during first half of millennia of its history, Islamic civilization has been keen to gain knowledge, be it physics, chemistry (alchemy), algebra, mathematics, astronomy, medicine, social sciences, philosophy or any other field. A critical analysis reveals that most of Muslim scientists and scholars of medieval period were also eminent scholars of Islam and theology. The earlier Muslim scientific investigations were based on the inherent link between the physical and the spiritual spheres, but they were informed by a process of careful observation and reflection that investigated the physical universe. Islam established the right of intellectual freedom for both men and women. As long as Islam preserved its immaculate character, it proved itself to be the main defender and promoter of knowledge and civilization and the ardent ally of intellectual liberty. Islam advocates to maintain balance between the life of this world and struggle for the reward in hereafter, thus asceticism and monasticism are not part of Islam. The blending of religious and other knowledge at lower and middle levels prior to separation at higher lever for specialization in a particular discipline, would broaden the vision and provide adequate depth to the students of religious and other sciences. This will enable the Muslims to regain the lost leadership, prestige and respect. Can Atheists Support Freedom of Conscience ?